After nearly a decade of working as a psychologist for the North Carolina prison system, Letanya Love ’98 had had it with what she called the school-to-prison pipeline. Young men falling behind in school early on grow up in a system that marks them as failures, and in their teen years, they rebel and look for success in antisocial ways. Then, at an age when the world should be open to their dreams, they sit in Letanya’s office, going over their very limited options. Letanya knew change had to start early, and she wanted to be part of that transformation. She made arrangements to work part time for the correctional system and enrolled full time in a doctoral program in school psychology at UNC. Ever since her undergraduate years, Letanya has been working to help teens make the most of their choices. Her personal history provided some of her motivation. Her parents had just begun high school when she was born, and as she grew up, she became attuned to the sacrifices her mother made to raise a child, in a low-income family, while finishing high school. Growing up in Gastonia watching Carolina basketball games with her uncles, Letanya decided in the third grade that UNC was the school for her. She concentrated on academics throughout high school and was the only African-American in her class to graduate with honors. UNC-Charlotte offered her an N.C. Teaching Fellows Scholarship that would pay all of her college expenses, but she turned it down to enroll at Carolina with the help of a federal teaching scholarship. When federal budget cuts ended the scholarship after two years, she pieced together grants and loans to finish her degree and become the first college graduate in her family. Letanya brought a spirit of community and public service with her to UNC, and Carolina honored that, she said. 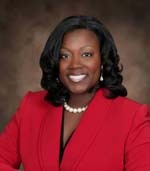 She pledged Delta Sigma Theta and became president of its Kappa Omicron chapter. She served as a Tar Heel Target coordinator, going to high schools to encourage minority students to apply to Carolina, and she was an adviser to minority students in the Office of Student Counseling. Letanya has a reputation for being persuasive. Her genuine enthusiasm for a project has a way of making people want to join her. As president of the sorority’s alumnae chapter — one of the youngest and most successful presidents at that — she launched a program to help teen mothers make the most of their lives. Yet some of the alumnae worried that a support program might seem to endorse teen pregnancy. With characteristic honesty and tact, Letanya made her case, and those initially hesitant became supporters. That power to persuade reaped benefits for the BAR Greek Challenge in 2013, which Letanya developed and co-coordinated, raising more than $20,000 for selected charities and MLK and BAR events. Her determination shines through without anyone feeling pressured. On the state level, Letanya has served on the steering committee of the N.C. Correctional Association since 2011 and was appointed to the Community Advisory Council for the Orange County Adolescent Parenting Program. She gave her time and strategic gifts to plan and oversee the expansion of BAR social events and engage young alumni through the BAR Young Alumni subcommittee. Professionally, Letanya has dedicated her life to working with those who are under served and at risk for not reaching their potential: juvenile and adult offenders, teen parents and school dropouts. She coordinates the delivery of all psychological services for two regional correctional centers that house more than 300 male inmates. As a friend, Letanya is ready with a big heart, a listening ear and a strong spine. She sometimes tells people things they don’t want to hear but they need to hear, challenging her friends and clients when it is in their own best interest to try harder. When she says, “How are you doing?” she means, “How are you really doing?” People respond to her sincerity. Though her path to success is not the traditional Carolina story, she said, she is grateful to the University for its role in shaping her into a leader.